Ultimate ProFit Advanced Superfood Nutrition is a superior blend of protein, mood-elevating “superfoods,” and soluble and insoluble fibers! Our delicious Profit Shakes have only 100 calories and only one gram of sugar which makes this delicious protein shake is a favorite in my house! I like the chocolate, but the vanilla ProFit protein shake is my absolute favorite. You will always find both flavors in my kitchen! I usually skip breakfast (the most important meal of the day) so I supplement with my ProFit shake. I mix 30 calorie vanilla almond milk and a scoop of Pro Fit and sometimes frozen fruit and this is my breakfast. It fills me up and gives me energy to start my day. I love my shakes! I also use them to make my favorite treats! 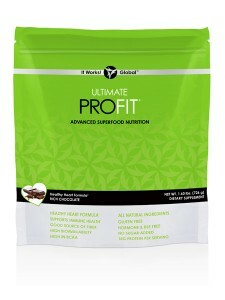 Check out these amazing It Works recipes using Ultimate ProFit! Some specific benefits include a quicker post-workout recovery, building lean muscle mass with fewer calories, maintaining healthy cholesterol levels and promoting healthy digestion with seven different soluble and insoluble fibers. Also get feel-good, mood-elevating energy with maca and cocao powder. This advanced formula is nutrition made for your muscles, immune system, digestive system and cardiovascular system. You will not only see results…you will feel results! This product is a 100% gluten-free product.